This free user-friendly utility helps you visualize which programs on your hard drive are using too much disk space. It creates a navigable pie-chart visualization of the space utilization on your computer. This utility is a great helper for when you get one of those messages from windows letting you know that you`ve run out of space, and wanting you to do something about it. 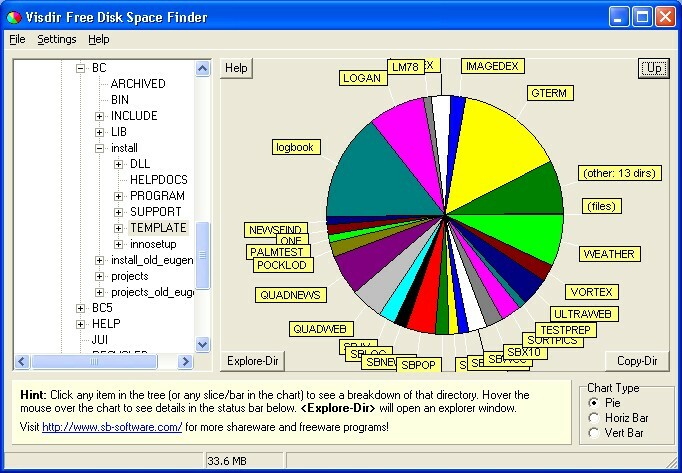 This program will help you determine which programs are using too much space. This software is freeware with no expiration, no disabled features, no spyware, no adware, and no gimmicks whatsoever. Works on windows 95/98/ME/NT/2000/XP.